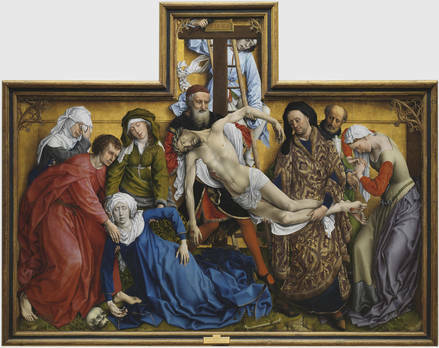 Rogier van der Weyden (c.1399-1464) , Prado Museum, 24 March – 28 June 2015. Exhibition devoted particularly to the important influence of the fifteenth-century Flemish artist’s work in Spain and inspired by the recent completion of the conservation of his Escorial Crucifixion, which has been at the royal monastic palace since 1574. The exhibition, curated by Lorne Campbell (formerly of the National Gallery, London), will bring together for the first time Van der Weyden’s Crucifixion with other masterpieces with a Spanish provenance including the Prado’s Descent from the Cross and The Miraflores Triptych, now in Berlin as well as his Antwerp Seven Sacraments Triptych and some 15 other works including large paintings, sculptures and tapestries. A symposium, ‘Rogier van der Weyden and the Iberian Peninsula‘, will be held on 5-6 May and address issues such as the significance of the Escorial Crucifixion and the relationships between Rogier’s paintings and sculpture produced in the Low Countries and in Castile, the career of the Brussels sculptor Egas Cueman, who settled in Castile, and the impact of Rogier’s work on the artists of the Iberian kingdoms. Registration fee: General 120€; Students 60€; Scholars professionals 75€. This entry was posted in Sculpture, Spain and tagged 2015, Castile, Egas Cueman, Exhibitions, Low Countries, Madrid, Museo del Prado, Prado Museum, Rogier van der Weyden, Sculpture, Spain on March 14, 2015 by Clare Hills-Nova.